We've mixed it with OJ, hidden it in flasks, refilled parents' bottles with water. But where did vodka come from? Take a good look at the vodka section of your local liquor store. On the upper shelves you’ll find shimmering glass bottles of all shapes and sizes originating from every corner of the world. Vodka today is the world’s most popular liquor and a true global commodity. Looking below the so-called top shelf import and boutique vodkas you'll see cheap, domestic products, their plastic bottles usually emblazoned with Russian symbols, often bearing the name of the Russian entrepreneur who fled the Bolshevik Revolution to set up shop in the West. 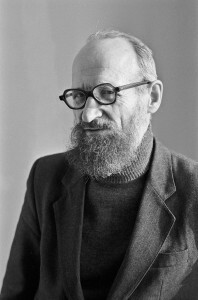 Vilyam Pokhlebkin was a unique cultural icon in Russia—beginning with his unusual name. His father, Vasily Mikhailov, was an ardent communist revolutionary, whose nom de guerre in the revolutionary underground—Pokhlebkin—invoked a traditional Russian peasant stew. Instead of the usual Ivans, Vladimirs, and Borises, when the Pokhlebkins had their first boy they instead named him “Vilyam” incorporating the initials of the great Bolshevik leader Vladimir Ilyich Lenin. After serving in the Red Army in World War II, Vilyam turned to culinary history as a researcher in the Institute of History of the Soviet Academy of Sciences, writing a popular history of tea, which became a literary sensation in tea-drinking nations. With his meager resources, he amassed a sizable library of rare manuscripts in his nondescript apartment in Podolsk—a sleepy industrial suburb due south of Moscow. In the repressive 1960s and 1970s under Leonid Brezhnev, Pokhlebkin’s culinary histories ostracized him from Soviet academia. His magnum opus—a collection of thousands of global recipes and their origins—was censored by the authorities: since even the most basic ingredients were widely unavailable, such recipes would shine an unwelcome spotlight on the inherent shortcomings of the Soviet system itself. Branded a dissident, he was effectively unemployed (and unemployable) in a country that boasted a job for everyone. According to the foreword of his Istoriya vodki, events then took a strange turn for Pokhlebkin. Perhaps borne of the same anti-Soviet sentiment that launched the Solidarity movement in the shipyards of Gdansk, in 1978 the communist government of Poland apparently sued the Soviet Union for exclusive commercial rights to the word vodka, claiming that it originated in Poland, not Russia. Perhaps the Poles had not read the single-paragraph entry on “vodka” in their standard issue Big Soviet Encyclopedia, which clearly states that vodka “was first produced in Russia in the late 14th century.” What more debate could there be? For the Russians, this was a stab in the back—their socialist allies in the Warsaw Pact were not only threatening the Soviets’ lucrative international trade; they were also inflicting an emasculating blow to Russia’s cultural heritage. Pokhlebkin claimed that definitively “proving” the origins of vodka with any degree of reliability was next to impossible due to a lack of surviving documents. Neither side could point to a page from their respective archives—such as the Scottish Exchequer Roll of 1494–95 that established the origins of whiskey or the famous German Beer Purity Law, the Reiheitsgebot of 1516—to settle the dispute. As his story goes, the Soviet export ministry, known as Soyuzplodoimport, first turned to the organization known (in typically longwinded Soviet bureaucratic parlance) as the “Higher Scientific Research Institute of the Fermentation Products Division of the Central Department of Distilling of the Ministry of the Food Industry of the Union of Soviet Socialist Republics,” which could not pin down the origins of vodka. In a move that has even been immortalized as a pivotal scene in a recent Russian novel, the dismayed government authorities turned to Pokhlebkin: the only man who could establish the Soviet Union’s legal claims before the international court and in the process defend Russia’s national pride. In private, Pokhlebkin was eccentric and ascetic: though amassing an impressive collection of historical manuscripts and exotic teas, he nonetheless denied himself a simple television or telephone, relying instead on written correspondence and telegrams. In his later years, Pokhlebkin became a paranoid recluse—seldom emerging from behind the numerous locks on his Podolsk apartment door for fear of being followed . . . or worse. Thirty years in the same three-room apartment, he never opened the door to strangers—including all manner of inspectors, repairmen, and plumbers. Vilyam Vasilyevich Pokhlebkin was last seen alive on March 26, 2000: the same day that a man with the same monogram—Vladimir Vladimirovich Putin—was first elected president of Russia. After returning on the suburban commuter train from a meeting with his publisher in Moscow, Pokhlebkin was apparently followed from the train station, set upon by thugs, and brutally murdered in his own home. Pokhlebkin’s body—stabbed eleven times with a long-handled screwdriver—was found weeks later by his chief editor, Boris Pasternak (grandson of the world-famous author of Dr. Zhivago), who demanded that the police smash in the door to Pokhlebkin’s apartment after his dependably punctual writer suddenly stopped returning his letters. According to the police investigation, none of Pokhlebkin’s most valuable possessions—his vast collection of rare manuscripts—were taken from the apartment. Moreover, according to the autopsy, Pokhlebkin had the equivalent of an entire bottle’s worth of vodka in his bloodstream—very suspicious, since despite his subject of expertise, Pokhlebkin never drank alcohol. The brutal murder of Vilyam Pokhlebkin remains unsolved even today. Speculation continues to swirl over culprits and motives: some even alleging that he was murdered by a vengeful Pole in retaliation for securing “vodka” for the Soviets. As claimed by the producer of the 2005 investigative documentary Death of a Culinarian: Vilyam Pokhlebkin—which aired nationwide on Rossiya channel 1—“Pokhlebkin has reserved for himself a place in Russian history by saving Russia millions of dollars, perhaps tens of millions of dollars” by conquering Poland in this so-called “vodka war.” As the tragic stories of Pokhlebkin have grown, so has his legend. Clearly, Vilyam Pokhlebkin is the unquestioned authority on vodka history. Over the past twenty years dozens of popular books and hundreds of articles and webpages—in Russian, English, and other world languages—have recounted his research and findings, his stories and anecdotes from the pages of Istoriya vodki, almost verbatim. The problem is that Pokhlebkin is dead wrong, and much of his heralded Istoriya vodki is a complete fabrication. Christian soberly chronicles Pokhlebkin’s many inaccuracies and misleading conclusions, from his claims that no etymological dictionaries mention the word vodka to suggesting that unlike vodka, beers and mead were never subject to taxation. Beyond these, I have uncovered even more factual errors, from the sloppy—dating Ivan the Terrible’s establishment of taverns from 1533 instead of 1553—to the substantive, such as discussing the reign of Vasily III Temnyi (“the Blind”) in the 1420s, even though such a leader never existed. Perhaps he was referring to Muscovite grand prince Vasily III, who reigned in the early 1500s, making Pokhlebkin’s timeline off by one hundred years! Whether from sloppy research or (in some cases) mistakes in translation, the sheer quantity of obvious historical inaccuracies casts serious doubt on Pokhlebkin’s authority: a problem multiplied as his mistakes are renowned as unquestionable truths and reproduced far and wide. Indeed, Pokhlebkin asks that his arguments be taken on trust—and for whatever reason, most Russians continue to extend him that trust. Many popular vodka books are compiled by uncritical writers, and are often printed by the publishing wing of Russia’s most famous distilleries. So perhaps the producers of such pop histories aren’t particularly interested in investigating the matter further. This is not to suggest that there was no sparring over the geography of alcohol. As in previous battles over geographically specific alcoholic products, such as French champagne, cognac, and Bordeaux, it follows that similar disputes could arise over vodka. Throughout the 1970s, the Poles claimed that vodka had been drunk in Poland since the early fourteenth century and that by the sixteenth century distillation was taxed. But such a definitive, internationally recognized legal ruling “proving” beyond doubt that vodka originated in Russia simply never happened. Following the anti-Soviet rumblings of the Solidarity movement, one would expect that such a symbolic “victory” for the Soviets over their restless subordinates in Poland would make headlines globally—or at the very least in the Soviet Union. But there was absolutely no mention of it in the global press. Scouring the archives of the main Soviet newspapers, Pravda and Izvestiya, likewise uncovers nothing. In fact, no Russian periodical or academic journal ever mentions this alleged “case” until after the release of Pokhlebkin’s book in 1991. Only recently have Russian writers stopped taking Pokhlebkin’s claims on faith and started to aggressively factcheck them. In his 2011 book Bolshoi obman ("Grand Deception: Truth and Lies about Russian Vodka"), Boris Rodionov concludes that virtually everything Pokhlebkin wrote about vodka was “a grandiose mystification.” Too many questions remained: If this dispute with Poland was so crucial to both Soviet finances and national pride, why wasn’t Pokhlebkin immediately given unfettered access to the Soviets’ vast archives? (He wasn’t.) Why wasn’t this lone, outcast academic given an army of research assistants? (He wasn’t.) And how could such a herculean research task be completed by one man in just a few short months? In burying this myth, the final nails in the coffin comes from Yuri Zhizhin, the director of Soyuzplodoimport from 1974 to 1987, and Boris Seglin, the head of the firm’s legal department, who both confirmed that no one ever commissioned Pokhlebkin to undertake such research as he had claimed. What’s more, in subsequent interviews, they claimed that the Poles had never taken the Soviet Union to any international court over vodka’s origins . . . ever. “Since most of the world’s population already associates vodka with Russia,” Zhizhin claimed, “proving that we alone have the rights to the word ‘vodka’ is like trying to stake our claim to a perpetual motion machine. It’d be a waste of effort and money.” Certainly this would help explain why Polish officials have no knowledge of this “case” that Pokhlebkin alone claims they lost. Most remarkable about Pokhlebkin’s fabrications is how they have been elevated to the status of legend: standing above serious scrutiny for two decades. But whatever reasons Pokhlebkin had for constructing and executing such an audacious deception, he certainly took them to the grave. If the unquestionable Pokhlebkin is now to be questioned, we are back to where we were before we entered the Vodka Museum at Izmailovsky Park, asking again: “where does vodka come from?” Fortunately, there are other theories. Polish-American historian Richard Pipes has suggested Russians first learned distillation techniques from the Tatars of Asia in the sixteenth century. Whether by “pot distillation” where the alcohol was driven-out of fermented beverages in pots placed in a stove, or a “Mongolian still”—where they were left out to freeze so that ice could be removed from concentrated liquid alcohol—such indigenous experiments were crude. They were often fatal, too: producing highly concentrated “fusel oils”—poisonous liquids produced by incomplete distillation that are today used in industrial solvents and explosives. So it seems unlikely that vodka immigrated to Russia from the east. Not all Russian historians agree with Pokhlebkin’s designated birthdate of vodka as 1478 or its birth place in Moscow. Some go back even further, dating vodka’s origins from the year 1250 in the ancient Russian city of Veliky Novgorod—the ancient trading outpost between the Hanseatic League and Byzantium. How did they come by this claim? In the early 1950s, Artemy Artsikhovsky—head of the archeology department of the prestigious Moscow State University—excavated the soil around ancient Novgorod. Deep in the waterlogged clay archeologists unearthed more than 950 well-preserved letters—written not on paper (as papermaking was not yet widely known), but etched into the bark of local birch trees. These resulting birchbark documents give a unique snapshot of everyday life in medieval northern Europe. Among these fragments of bark are numerous texts dating from the late 1300s (such as no. 3 and no. 689) that refer to the brewing of barley. While fermented beers, meads, and wines were known throughout northern Europe, distillation is an entirely different technology and constituted a historic technological achievement. It is tricky to interpret these documents, since they are not in Russian but, rather, an Ancient Novgorodian dialect of early Slavic and Finnish/Karelian languages. That issue notwithstanding, historian A. P. Smirnov (no relation to the vodka of the same name), focused particular attention on birchbark document no. 65, which clearly includes the letters that spell the word ВОДѦ, pronounced vodja. Linguists agree that the word vodka is the diminutive form of the Slavic word for water: voda. Certainly vodja sounds a lot like the Russians’ dear “little water,” vodka. Since letter no. 65 dates from the mid-thirteenth century, therefore—according to Smirnov—this supposedly “most important document in the history of the production of vodka” dates its birth to 1250. If this sounds like an even bigger stretch than Pokhlebkin’s fabrication, that’s because it is. First of all, Russian archaeologists determined that the stratum in which this document was found dates from the early fourteenth century at the earliest. Besides, any archeologist knows that fieldwork is never so precise as to pin down any specific year. As with Pokhlebkin, these scientists’ claims are far more precise than the evidence warrants. Second, Smirnov does not explain how or from whom the early Novgorodans learned the science of distillation, since 1250 predates the technique’s arrival even in Europe. So it seems we are back to square one, yet again. Vodka—along with all modern spirits like gin, brandy, rum, and whiskey—traces its history back to the distilled aqua vitae, or water of life, of twelfth century European alchemists. By the fifteenth century, this technique of driving out higher concentrations of alcohol from a mash of fermented grains had arrived in Moscow. But beyond that, the details are a little . . . fuzzy. According to a legend retold by Pokhlebkin, a Greek monk named Isidore—who learned distillation as part of a Russian church legation to Italy in the 1430s—was suspected of having divided loyalties and upon returning to Moscow was imprisoned in the Chudov Monastery of the Kremlin. Having no other raw materials than local grains, the crafty Greek created the first batch of “genuine” Russian vodka, which he then slipped to his captors, fleeing to Kiev after they passed out. Like most of Pokhlebkin’s claims, there is absolutely no factual basis or documentation for this whimsical tale. Think: why would a suspected traitor be imprisoned in a monastery with the tools of chemistry instead of (the more conventional) punishment of being tossed in a dungeon and tortured ruthlessly? What’s more, the entire story oozes with Russian nationalist symbolism: vodka was allegedly born in the Chudov Monastery—the Monastery “of the Miracle,” which was completed in 1365 and razed by Stalin in 1929 to make way for the stolid, concrete Palace of Congresses. Although the legend cannot be taken seriously, many in Russia continue to date vodka’s origins from the 1440s based primarily on this tale. Some suggest the science of distillation entered Russia from the Genose port city of Caffa (present-day Feodosia) on the Crimean Peninsula, by refugees fleeing the invading Mongols in 1395. Another, more plausible alternative is that it came from central and Western Europe via long-established Hanseatic trade routes to Russia’s Baltic outposts of Pskov and Novgorod. The importation of wine along this trade route has been regularly documented as far back as 1436. Forty years later, the archbishop of Novgorod presented lavish gifts to Ivan the Terrible’s grandfather—Grand Prince Ivan the Great of Moscow—including barrels of both red and white wines. While these wines were prized as fantastic luxuries, there is no mention of aqua vitae, much less vodka. So, where and when did vodka originate? Who was the first person to distill local grains into a potent alcoholic beverage—and was he Russian or Polish? We may never know for sure. Anything I claim here would be speculation based on inference and conjecture, and probably no more definitive than the efforts of the “luminary” culinary Pokhlebkin, whose testament still stands as the well-thumbed reference at the Vodka Museum at Izmailovsky Park. Ultimately, though, it does not matter much beyond the occasional barroom brawls between nationalist Russians and Poles. What we do know is that by whatever route or as a result of whoever’s handiwork, by the early sixteenth century the medicinal aqua vitae of the alchemists had already taken root as “burnt wine” or what we might recognize as beverage vodka. And Russia would never be the same again. Reprinted from "Vodka Politics" by Mark Schrad with permission from Oxford University Press USA. Copyright 2014 Oxford University Press USA and published by Oxford University Press USA. (www.oup.com/us). All rights reserved.